Why Should You Choose Cruise Vacations? In today's world, reality is, the internet has made every little bit of information about anything accessible to everyone and travel is no exception. Buying direct happens. Its confusing and scary. Sometimes it may appear to be cheaper sometimes its not. That's just a fact. What is not available on the internet is KNOWLEDGE. That is our competitive advantage. You can count on that and that is what we provide for our clients, both those that come to us online or those that walk through the door or call on the phone. Cruise Vacations Winnipeg is a proud member of one of North Americas premier consortia, Ensemble Travel Group. Over 1000 of North Americas best travel arrangers are members of Ensemble. They benefit through access to high quality tour arrangers from around the world as well as quality marketing initiatives to keep you the consumer in touch with travel trends. 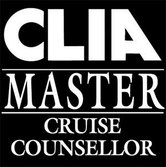 Cruise Vacations is also a member of Cruise Line International Association (CLIA) for the past 24 years as well as Association of Canadian Travel Agents ACTA with a strict code of ethics for all members.